"This vanity is constructed from solid wood so it will stand up to humidity and wear." "A budget-friendly vanity that still looks great." "100% wood and topped with an authentic Carrara marble countertop imported from Italy." "Reviewers absolutely adore this vanity, writing that it's made from high-quality materials and is very sturdy." "The perfect complement for an ultra-modern bathroom." "Reviewers claim this is a very sturdy and heavy piece that will stand up to lots of wear and tear." "A vanity with a shelf underneath gives you a place to store fluffy towels, decorative touches, or just gives the room some open air." If you are looking for a transitional vanity that could work in both a traditional or contemporary setting the Arminta vanity is for you. A cool gray base hits all the trend-forward notes you are looking for in a remodel without being over the top. Contemporary hardware brings clean lines to the look but also provides function. The 42" width will work in most standard size bathrooms without being too overwhelming. The vanity has ample room to store all you would need in a master bathroom or gives you plenty to hide in a guest bathroom. This vanity is constructed from solid wood so it will stand up to humidity and wear over time. If gray is not your color–this also comes in a birch hue. If you’re redoing your bathroom on a tight budget, you might not have several hundred dollars to spend on a vanity. However, you can still get an attractive, high-quality bathroom fixture without spending an arm and a leg. This vanity will fit in with just about any style, and its affordable price makes it all the more attractive. While simple, this vanity is still incredibly functional. It measures 34” x 22” x 38”, and it’s made of medium-density fiberboard with a ceramic countertop. There are two soft-closing cabinet doors, as well as a cute shelf underneath the unit for linen storage. The cabinet hardware is in a brushed nickel finish, but note that the pictured faucet is not included. If you’re looking for a budget-friendly vanity that still looks great, you’ll be hard-pressed to find a better option than this. Reviewers say it has a simple, clean style that will look great in any bathroom. Plus, how can you beat that price? Have a little extra room in your bathroom? More spacious bathrooms need bigger vanities to seem balanced, so you may want to consider a product like the Katherine Bath Vanity. This oversized option gets top marks from buyers, plus its chic, modern appearance will lend a touch of elegance to any home. This single vanity is wider than many comparable options, measuring in at 47.5” x 22” x 35”. The product is made from 100% wood and topped with an authentic Carrara marble countertop imported from Italy. The unit comes fully assembled, complete with an undermount ceramic sink. The pictured backsplash and faucet are included with the vanity set as gifts, meaning they won’t be replaced if they arrive damaged. The Katherine Bath Vanity has ample storage, with six drawers and a cabinet. Reviewers note that this single vanity is elegant and well-made, and many write that it looks wonderful in a Victorian-style home. If you have a smaller bathroom, you may be a little strapped for storage space. Without a closet or cabinet in the room, it can be tricky to store all your toiletries, personal care products and linens—which is why the Aria Bath Vanity is a lifesaver! 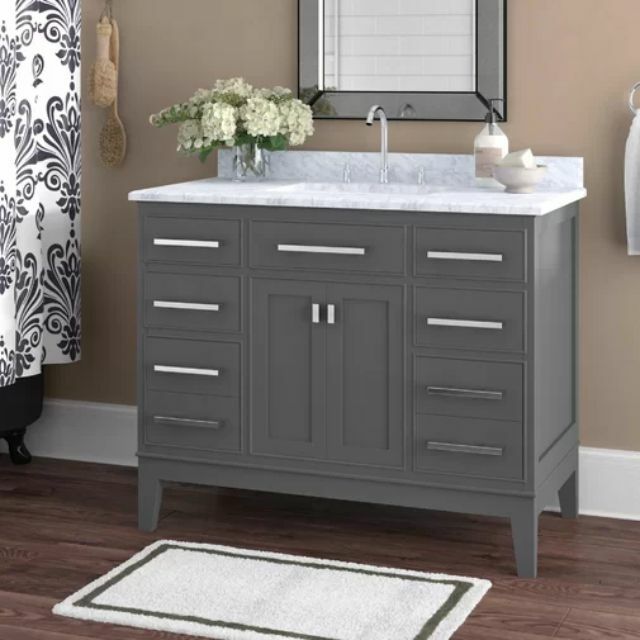 This beautiful single vanity has enough built-in storage space for all your bathroom essentials. The Aria Bath Vanity measures 36” x 22” x 35”. The base is made from 100% wood, and it’s completed with a beautiful quartz countertop, complete with an undermount ceramic sink. The vanity has an impressive four drawers, all with soft-close mechanism to prevent slamming, and there’s an under-sink cabinet, as well. This product does come with a quartz backsplash and silver faucet hardware, but because they’re considered a “free gift,” the company will not replace them if they are damaged during delivery. Overall, reviewers absolutely adore this vanity, writing that it’s made from high-quality materials and is very sturdy. For a contemporary single vanity, you may want to consider the Design Element Stanton Vanity, which has clean, simple lines and a very modern finish. This single vanity would be the perfect complement for an ultra-modern bathroom with a white and black color scheme. The Stanton Vanity is not as deep as many other options, measuring 36” wide, 18” deep and 35” high. It’s constructed from solid hardwood with a rich espresso finish and it features a beautiful porcelain countertop and integrated sink. The unit has four pull-out drawers and a two-door cabinet, equipped with soft-closing doors. The vanity’s satin nickel drawer hardware is included, and you also get a matching mirror with a black frame. However, you’ll have to buy your own faucet to go with this unit. Reviewers agree that this vanity looks great in a modern bathroom. However, one user did note that the assembly instructions can be a bit confusing, so use caution when you’re putting the piece together. If you want to avoid a white vanity why not try this soothing blue option that not only has an eye-catching color it also has an intricate design. This model has one cabinet and eight drawers so it has plenty of room to stow away all your beauty supplies. Nickel finish hardware and a Carrara marble top give top this off giving it a clean and crisp look. This vanity measures 36" so it should fit in most standard bathrooms. Reviewers claim this is a very sturdy and heavy piece that will stand up to lots of wear and tear over the years. A vanity with a shelf underneath gives you a place to store fluffy towels, decorative touches, or just gives the room some open air. This top pick does all of that in a transitional style that could work for many different style aesthetics. Made of solid oak and Carrara marble this vanity is built to last. The traditional look has a contemporary spin with its clean lines and hardware. Measuring 48" this vanity has one sink, but plenty of counter space. Reviewers say this comes fully assembled and it is very easy to install. One mentioned this is taller than your average vanity so be sure to measure before purchasing.